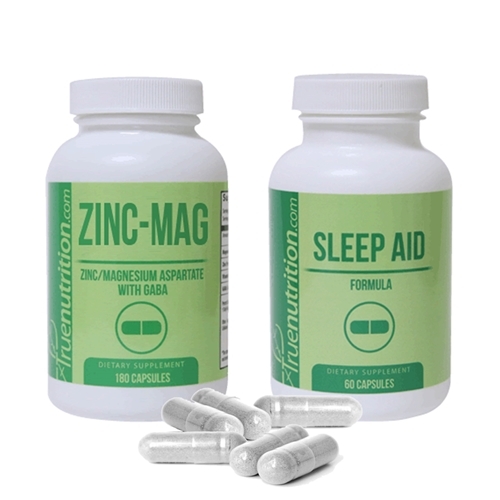 True Nutrition's top-selling sleep and recovery aids together for bigger savings! GABA, L-Tryptophan, Chamomile Powder Extract (Matricaria Chamomilla)(herb), Valarian Root Powder Extract (Valeriana officinalis)(root), 5HTP, Melatonin. Magnesium Stearate, Capsule (Vegetable Cellulose). Magnesium Aspartate, GABA (Gamma-Aminobutyric Acid), Zinc Aspartate, Vitamin B6 (as Pyridoxine HCL). Maltodextrin, Magnesium Stearate, Capsule (Vegetable Cellulose).